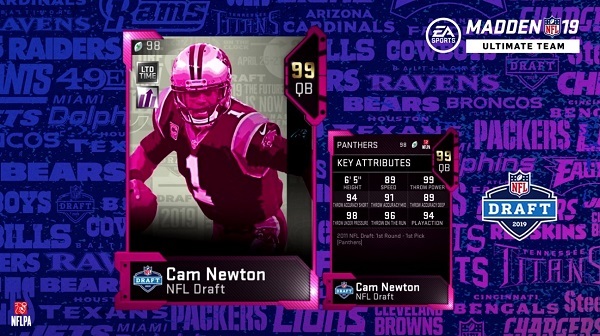 Do you think this Cam Newton is going to take over as the best quarterback in MUT 19? Great, another Qb that will run 20 yards back and then throw a perfect spiral while running to a playmaker or returning receiver. Just what we needed. EA should do a house rules that only allows you to use every play once and only once in the game except for kicking plays. Its called Madden Mobile Overdrive. I thought it was supposed to be "MUT season" I guess 1 card every other day is the "lots of content" that's supposed to come with this supposed MUT season. These devs seriously make no sense. Sometimes we'll get a hundred cards in a couple of days. Sometimes we'll get 1 card over a 5 day period. A little consistency, and a whole lot more transparency would go a long ways. But then again theyt think its hard to maximize profits if they reveal anything too soon. They want people to buy McNabb, one day, Vick the next, and then cam the week after. That's how they play the game. They are trying to scam everyone they can. And sadly it's really easy to scam some people in this community. Which is why I believe MUT will become illegal soon here in most states. Not just because it's clearly gambling. That would be ok. But the fact that they never give back equal value for what you spend is what's going to drive the nail through the Ultimate Team modes. But I'm rambling. Cam is good. I personally don't want the card though. I just wish they would of gave more than one card today, especially with nothing yesterday. They need to give out a schedule for upcoming releases, at least 2 weeks out. If not this game mode along with the devs jobs will be gone within a few years. Stupid card. totally undeserved. Might as well give Lamarcus Russell a 99. It's MUT, not real life. The name on the card is irrelevant. If the card plays like I want it to play, it makes the squad. Why do all the Newton cards come out before the Russel Wilson's? C'mon EA, Super bowl winner here.